Imagine, if you will, a time and place where college basketball players stayed four years. You had to win your conference tournament or you couldn’t play in the NCAA Tournament. Arenas were stuffed full of maniacal fans, and the pressure to win nearly drove coaches crazy. That was the Atlantic Coast Conference basketball Tournament when I was growing up. Today, the tournament means nothing other than the entertainment value of seeing your team play another game. If your team is good, they’re going to the NCAA Tournament the following week any way. If they’re bad, they could run the table and qualify for the NCAA’s the next week, but the odds of that happening are right up there with ordering a unicorn from Amazon, so in all likelihood, the season ends. But go back to 1970. No matter how good you were, you had to the win the tournament or you went home. 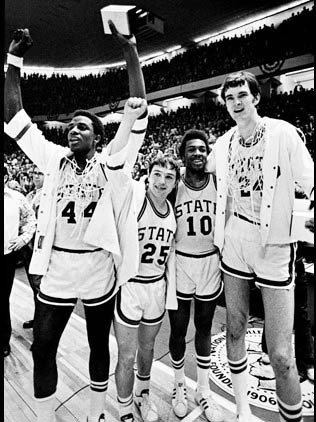 Before 1975, all conferences only got one bid to the NCAAs. Players couldn’t leave early for the ABA or NBA. Freshmen were ineligible. Heck, you weren’t even allowed to dunk. Getting a ticket to the event was like winning the lottery. The atmosphere was electric. The 1970 tournament is the first one I really remember, and it featured a South Carolina team that had gotten through the ACC with a perfect 14-0 record. They had John Roche, Bobby Cremins and a host of players the rest of the league really hated. They were cocky, physical and very good. They were ranked No. 3 in the country and the only other team in the field ranked was No. 19 N.C. State. If you weren’t an ACC basketball fan then, this game converted you. South Carolina, even though ranked No. 3, 14-0 in the ACC and 25-3 overall, didn’t go to the NCAAs. The Trip Turned Out To Be A Baseball Version Of "A Christmas Carol"
I just finished a week in West Palm Beach, FL watching spring training. Great weather, good baseball, wonderful people, and as close to having days where you don’t have a care in the world as you will probably ever experience. But if you look closer, you may see more. Like Charles Dickens “A Christmas Carol” I think I also got to see my past, present and future. The under-rated aspect of spring training is the people. All are bonded by one common interest – baseball – and one of the greatest aspects of following sports are great stories and great memories. 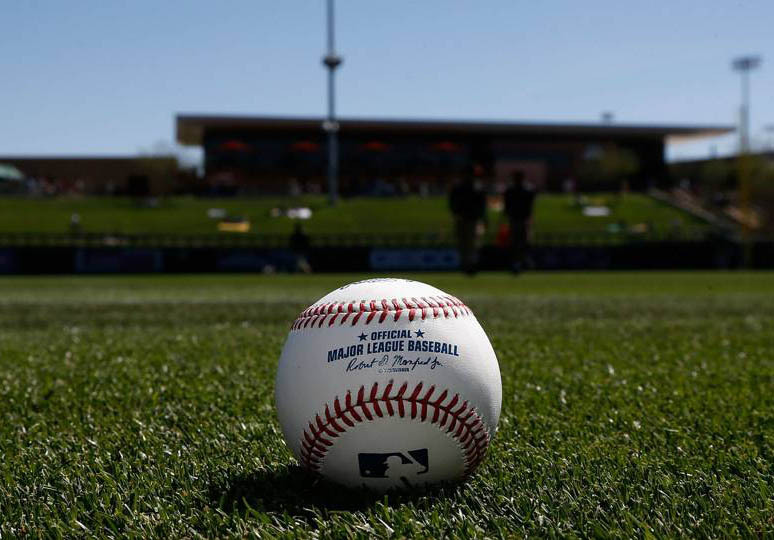 Sit next to someone in spring training and ask a question about baseball, and in a matter of minutes you’re like family. You have shared experiences through the sport, in both good times and heartbreak. There are exceptions – I’m looking at you Boston Red Sox fans – but by and large, the rest of us fans who haven’t enjoyed something like 137 titles in three sports over the last 15 years don’t speak with a spirit of superiority. This leads to some great conversations. The spirit of baseball past started for us from the very first game. My oldest and best friend Doug and I drove to Jupiter to see the Nats play the Marlins. I learned if you want to have great seats, go to a game involving your favorite team and the Marlins. They don’t show up for regular season games, so they show up even less for spring training games. Buy the cheapest ticket to get in, and then you can have your pick of any seat in the stadium. We sat under the covered area that was even with third base. A few innings into the game, a young man named Codey took a seat right behind us. He was a student at Ball State and he was a sportswriter, writing for the student newspaper. 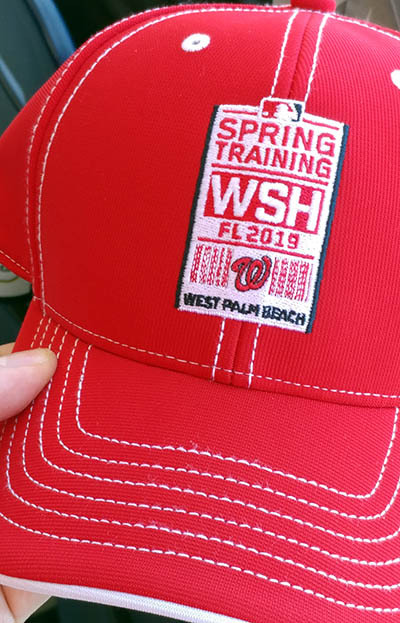 A group of students from Ball State had headed down to spring training for the experience of it, and he was looking for story angles. As I also worked my way through my final two years at Virginia Tech as a sportswriter for a weekly newspaper called the Blacksburg Sun, I couldn’t help but think “this kid is me 40-plus years ago.” As a result, the first thing we did was feed him. They had come down to Florida from Indiana with as many crammed into a car as possible, sleeping four to a cheap hotel room, and I was pretty sure the simple pleasure of a $6 hot dog was not in his budget. I know 1977 Dave would have appreciated it. We spoke of baseball in the 60s and 70s, as Doug and I talked of following Frank Robinson, Hank Aaron, Pete Rose, Bob Gibson and many more that were probably ancient history to him. We talked about Bryce Harper going to the Phillies. I talked with him about sportswriting as a career, gave him all the advice I could without sounding like his Dad (my own father’s advice had been to give up sportswriting, come home, drive a truck and make more money), and because he’s a Ball State alum, even talked about David Letterman. After a few innings, he left to pursue other conversations. Two sportswriting baseball fans of different generations, passing in the bright Florida sun. 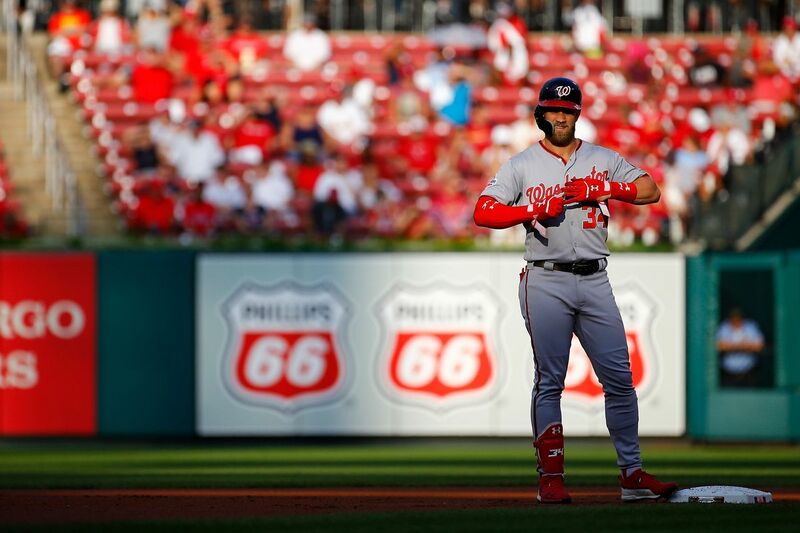 It’s been about 24 hours since the Bryce Harper trade to the Phillies was announced, and I still can’t get my head around one aspect of his career here in Washington. Understand that I loved watching him grow up with the Nationals, and I will really miss him no longer being with the organization. But when you start applying the “great” tag to any athlete, you usually can think quickly of a signature play or two that reminds you of that greatness. You can certainly do it with Alex Ovechkin and the Capitals. Think of John Riggins and the Redskins, and it’s going to be 70 Chip in the Super Bowl. Michael Jordan and the Bulls? It’s him, tongue handing out, doing some incredibly acrobatic shot driving to the basket. But with Bryce, when I scan my brain for such moments, I struggle. Lest you want to argue he’s not that great yet, don’t bother. By virtue of the contract alone, that says the league judges him at such stratospheric highs. It will pay $330 million over a time period that starts today and ends when a kid who is in third grade will finish their senior year of college. Wasn’t that many years ago franchises themselves weren’t worth that much. So in trying to remember such signs of greatness, my mind first went toward walkoff home runs. Bryce certainly hit some mammoth shots during his time here in the most powerful city in the world, but when I think of great walkoffs for the Nationals, he’s not even in the top 3 of my personal memory bank. I don’t know about you, but just about my entire life, I’ve seen all the sayings and memes about living each day to the fullest. Carpe Diem, etc. But the truth is, if you’re a person who saves, who always feels the brunt of responsibility, who plans out for every “what-if” there is, you push out things you’ve always wanted to do and will one day be old. These habits become very hard to break. And many of the things you say you’ll one day do, they never end up being experienced. Such is the case for myself and my old friend Doug. We’ve known each other since college, as he was the first guy I met at the dorm (Pritchard Hall) at Virginia Tech when I was moving in. We’ve stayed lifelong friends and have had a thousand conversations about “one day” when we’d go see this, or go do that. We’re in our 60s now. We still talk about “one day” and it wasn’t until a few weeks ago we talked about how the list of things on our bucket list is still pretty lengthy, while our volume of “one days” is growing ever smaller. We broke through it three years ago when he flat out shamed me into going with him and another classmate to South Bend, Indiana to see Virginia Tech play Notre Dame in football for the first time. We had said since our time as college students that if the Hokies ever played Notre Dame, we would go. When the game was announced 40 years after we promised we’d do it, he was on the phone to remind me. Honestly, I hated the idea. I hate to fly, things were busy here at home, and the weather was supposed to be sub-zero. We went. The weather was worse than we ever imagined, but we were there. Three years later, it is still a memory I cherish, and it ended up being something I wouldn’t have done if Doug hadn’t forced me. The weather outside tomorrow is supposed to be frightening. Snow, ice, gloom of night….the whole deal. You don’t need the weather channel to tell you this. Just go to a grocery store. For the 11 people in Ashburn who weren’t there around noon, well, we missed you. But everyone else was stopping by to pick up “just a few things” in case we’re snowed or iced in for a few days. You go in expecting to spend $25...but wheel out a cart filled with over $100. Traditionally, we all make fun of people rushing to buy milk, bread and toilet paper, but that isn’t a need for us these days. Milk certainly is, but it’s not the No. 1 item. Bread is something we tend to buy in bulk when it’s on sale and stash extra loaves in our second freezer in the basement, so it’s doubtful that’s ever an emergency purchase. And toilet paper? Well, thanks to warehouse clubs or Amazon forcing you into a subscription to save another 5 percent, we’re usually closer to having 28 rolls on hand instead of one. Coffee Creamer. Let’s face it, there are millions of people out there who fashion themselves as coffee connoisseurs because they waste hundreds of dollars going to Starbucks. Truth be told, coffee is just an excuse to have something in a cup they can pour some sweet creamy substance over. My vice is Coffee-Mate’s Sweet Italian Cream, and since they make a sugar free version of it, I can tell myself I’m not really doing anything unhealthy when I pour one-fourth of the bottle into a mug of fresh ground dark French roast coffee. I had three bottles in my refrigerator this morning, but with the threat of snow, upped my inventory position to 5 at noon time. Some things are not worth playing around with. Doughnuts. If the snow is going to create a holiday, then you need to make it feel like a holiday. Ever since I first got married, a snow day meant a trip to Krispy Kreme to reverently peer at the “Hot Doughnuts Now” sign and then go get a variety of two dozen doughnuts. Part of it was due to “because we can” as we bought a four-wheel drive soon after getting married, and there was a certain specialness to being on the road when you shouldn’t be, prevailing against the elements to get a heavily glazed fresh jelly doughnut. And if it got too bad, we always found quite a few local law enforcement folks at the doughnut shop, so it’s not like we were going to end up cold and alone. Sadly, Ashburn doesn’t have Krispy Kreme, so we have to settle for a wide variety of either Entenmann products, or whatever fresh doughnuts Harris-Teeter and Giant have in their cases. For the first time in a while, I actually enjoyed watching every lap of a NASCAR race today. 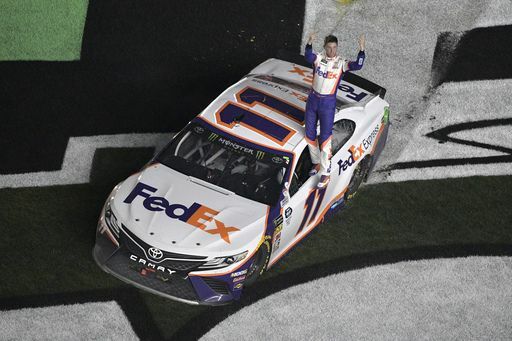 The Daytona 500 was actually that good. And it needed to be. NASCAR has in the past few years drifted aimlessly. If you didn’t notice all the empty seats when you occasionally tuned into a race, you definitely noticed the lack of drama or excitement. While it’s true some of that has been caused by bigger names in the sport having retired recently, there was more to it than that. NASCAR just didn’t put on a very good show the last couple of years. The racing was boring, the prices to attend was too high for its core audience and NASCAR didn’t seem to care. It was becoming like the 50th franchise of a once-tremendous restaurant. The name brought back great memories of the past, but current events seemed a little like people going through the motions. Add to the fact that it’s not rocket science to figure out what makes for an entertaining show on a race track, and it became all the more frustrating. Older fans stopped paying attention, younger fans weren’t engaging in the first place and there became a growing problem. Great races generally need only three things: close racing in the early stages so someone won’t change the channel or take a nap, some sort of big wreck in the middle that becomes a huge video highlight (as in “hey, did you see that wreck Sunday?”) and then 5 or six cars racing to a photo finish on the last lap. That’s it. That’s the list. Everything else is gravy. Over the past couple of weeks, there has been a contentious phrase used on social media that has really annoyed me. The phrase is “learn to code.” Twitter views it as a personal attack and will suspend you for merely saying it, mainly because a while back, there were some immature journalists who decided to tell coal miners who had lost their jobs they should just reinvent themselves and “learn to code.” They said it in such a snobbish way that it almost sounded like “die off dinosaurs,” so when journalists started losing their jobs and others returned their words with an equal harshness, I can’t say I had a tremendous amount of sympathy. 20 years ago, when the web was exploding, I went out and bought a book on HTML programming. Playing with computers was always a hobby of mine, and HTML wasn’t that difficult. The commands and tags were somewhat intuitive, and in the infancy of the web, websites were essentially billboards. Get some art, put up a banner, keep your copy in nice, neat tables, and you’d have a decent website. It’s gotten more and more complicated, but the average person could keep up if you knew basic HTML. Sites went from simple to complex pages you customized in content management systems. CMS’s are kind of like a race car where they give you the engine, roll cage, steering wheel, etc. You have to figure out what the paint scheme will be (unless you want your site to look like everyone else’s) and you have to decide in what direction you want to drive it. But if you spend minimal time keeping up, that’s not all that difficult. But why, you ask, does that matter? Why do you want to be able to write a website? 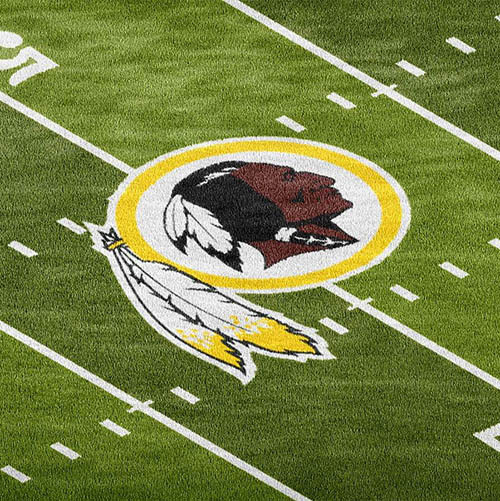 That the Washington Redskins hit rock bottom as a franchise Sunday came as little surprise, as they have seemed to be executing a plan to get there over the last few years. But the speed in which they did it is still amazing. Think about it: Just a little less than three years ago, the team had won the NFC East. The team had gone 9-7, finished the regular season with 4 straight wins, and 5 of their last 6 to win the division. They had a sharp young offensive coordinator in Sean McVay, and the fruits of his hard work and imagination were obvious: QB Kirk Cousins threw for over 4,000 yards, the running back committee of Alfred Morris, Matt Jones and Chris Thompson rushed for 1,457 yards. There were dangerous receivers in Jamison Crowder, Pierre Garcon, Jordan Reed and DeSean Jackson. The team had weapons. It was entertaining to watch. And despite the loss to Green Bay in the first round of the playoffs, the future looked bright for the Redskins. They had to shore up defensive issues, but they had an offense that seemed as if it could score on anyone. That was only three short years ago. Compare it to what was on the field yesterday. Yes, you can point to injuries and bad luck and all sorts of reasons to rationalize being down 40-0 to a 4- win team and losing your fourth game in a row on your way to a 6-10 record. But that’s the nature of the game. A lot of teams encounter this without having a weekly search to see who can be found on the streets to be your starting quarterback. This is the year, sadly, that the streak comes to an end. No, not that one about Virginia Tech and Virginia in football. I’m talking about the streak I’ve held in our household for Thanksgiving dinners. My wife and I are celebrating our 38th Thanksgiving dinner Thursday since getting married back when the dinosaurs roamed the planet. And every year, no matter where the dinner is, I’m the guy who carved the turkey. This is due to the fact that 99 percent of the time, the dinner has been in my own house, which has allowed me a tremendous home court advantage. I even have a special carving knife that’s the size of your arm, and you can just hear Crocodile Dundee saying “now THAT’s a knife” as I pull it out of the kitchen drawer. But not this year. 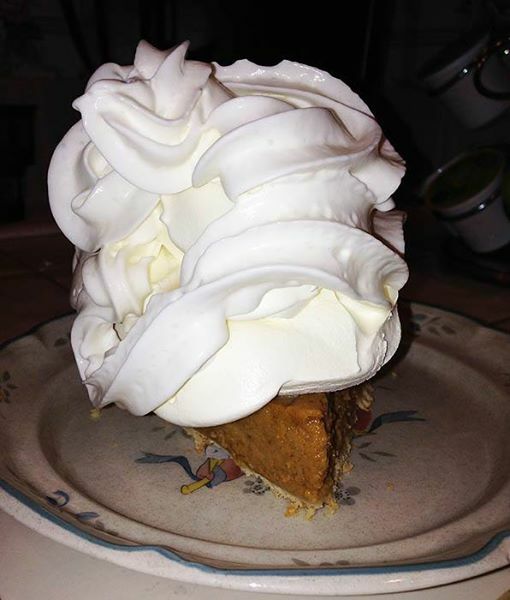 My wife’s mother mentioned in passing late last week that her plans for Thanksgiving hadn’t really panned out, so she was just going to stay at home. Alone. On Thanksgiving. This, of course, is roughly equal to driving a stake through my sentimental heart, so I suggested to my wife that we just drive to Roanoke for the day to address this. Because of everyone’s schedules, the only option was to drive down Thanksgiving morning and make it a day trip, which will allow us to spend the day there, but won’t allow time for cooking. Bring some Thanksgiving magic to Blacksburg Friday!